Monarch Of Egypt was an emphatic and notable debut winner at Naas as his sire American Pharoah proved an instant success with his first runner on the track. US Triple Crown winner American Pharoah was also supplying Aidan O’Brien with victory at the first attempt with his two-year-olds this season as Monarch Of Egypt led almost throughout under Ryan Moore and then sprinted clear to score by two and three-quarter lengths. There was no answer to the 9-10 favourite’s burst of speed in the five-furlong opener, the Irish Stallion Farms EBF Race, and Betfair were equally quick off the mark with a quote of 14-1 for the Coventry Stakes at Royal Ascot. O’Brien provided first and second in the Irish Stallion Farms EBF Maiden as eventual winner South Pacific and Barbados had the race between them clear of the field from the outset. It was the more compact but less experienced Barbados who led the way under Moore until deep into the final furlong. Even-money favourite South Pacific loomed large on his outside, though, and battled on to win by short head under Donnacha O’Brien – breaking his duck at the sixth attempt, having been unluckily brought down at Leopardstown on his first run of the season after a series of creditable efforts as a two-year-old. O’Brien said: “We like both horses. Ryan’s horse was still a bit green, and Donnacha’s horse likes a lead. “It was nice for Donnacha to get a winner on him after the fall (last Saturday). He can go back to a handicap, and Donnacha thinks that he might get a mile and a half. Real Force came from slightly off the pace to prevail at 25-1 from even bigger outsider Shining Forth in the Foran Equine Irish EBF Auction Maiden. Capel At Dawn led into the final furlong, but was overhauled by both Real Force and the 50-1 runner-up. Gerard O’Leary’s winner, ridden by Killian Leonard, had half a length to spare at the line – with the same distance back to the long-time leader in third. Leonard explained he had been very much on a reconnaissance mission with the newcomer. “I’d never sat on him before and was told he was very green and hadn’t much done,” he said. “I was to try and teach him and bit, and have him coming home. “He was plenty raw enough early on – but the further he was going the more the penny started to drop with him, and he went to the line well. The imposing Flash Gordon was a decisive debut winner of the Irish Stallion Farms EBF Maiden for the new Jessica Harrington-Shane Foley partnership – and a 100th worldwide for owner Fiona Carmichael. After the three-length victory at 9-1, from favourite Clashaniska, the winning trainer said: “We always liked him last year – but you can see the size of him, and we never got to run him. 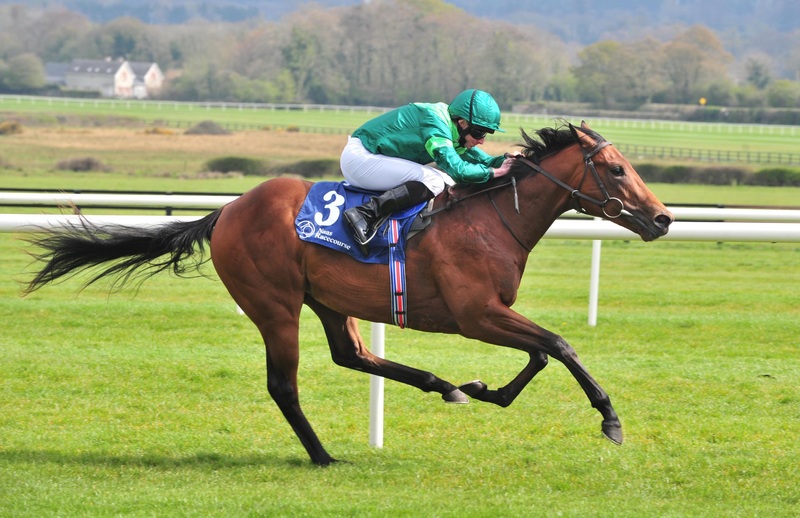 Joint top-weight and 3-1 favourite Mokhalad wore down the pace-setting Verhoyen to take the Royal Ascot Trials Day 19th May Handicap by three-quarters of a length for trainer Damian English and jockey Donagh O’Connor. Verhoyen weakened into a third, a neck further back, as Clifftop Dancer took second. Joseph O’Brien was carried back into the paddock by members of the winning Blackrock Syndicate after Arthurian Flame (5-1) won the finale – giving his brother a double. “I’m delighted for all the lads. It’s the first horse I’ve had for them and I think it’s the first horse they’ve had. Hopefully they will have plenty of fun with him,” said the winning trainer.